'Can’t I respond as an Indian?' asks the AIMIM chief. On March 3, the chief of Rashtriya Swayamsevak Sangh, Mohan Bhagwat, said that India’s youth should be taught to say “Bharat Mata ki Jai”. This was against the backdrop of the incident on February 9 at Jawaharlal Nehru University where anti-India slogans were allegedly shouted. Right now, three JNU students are out on bail, facing prosecution for committing sedition against the government, even though the initial proof of their raising "anti-India" slogans was based on doctored videos aired by TV news channels. 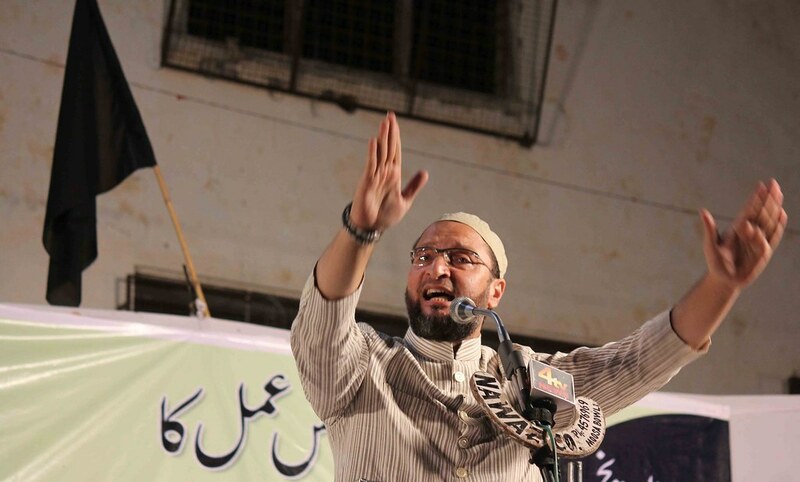 On March 13, Asaduddin Owaisi, head of the All India Majlis-e-Ittehad-ul Muslimeen party in Hyderabad, responded by saying that he will not chant “Bharat Mata ki Jai” even if a knife is put to his throat. 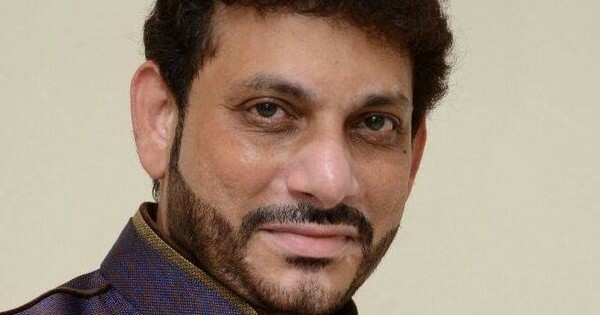 On Wednesday, matters rapidly escalated when AIMIM member Waris Pathan was suspended from Maharashtra Assembly after he refused to say “Bharat Mata ki Jai” on being exhorted to do so by a Shiv Sena member and the Congress party demanded his suspension, which was supported by legislators of all other parties. In the following interview, Asaduddin Owaisi expands on why he refused to chant this slogan. I’ll start off with a simple question. What is wrong in saying “Bharat Mata ki Jai”? I know that during the freedom struggle there were many slogans used by the freedom fighters. One of the slogans was this one. Others were "Inquilab Zaindabad", "Jai Hind" and so on. So let me make it clear that I have no issues whatsoever if someone else says “Bharat Mata ki Jai”. I am aware that that the slogan “Bharat Mata ki Jai” gives divinity to the nation and if the RSS says that I have to say it otherwise I will be branded anti-national that is wrong. I have strong objections to someone forcing it down my throat and declaring that this is what you have to say to be patriotic, otherwise you won’t be called an Indian. By framing patriotism in such a way, you are by definition branding Muslims unpatriotic, when they are not. When we read the Preamble of the Constitution, does it mention the word “mata” or mother? It only mentions “Bharat, that is India”. Therefore, I have the right to say what I want to under article 19, Article 25, 29 and 30. These are fundamental rights of the constitution. This is what the RSS is trying to do to – to ensure that I lose my religious identity, which the Constitution of India guarantees, which is a fundamental right. And let me make it very clear that I am a loyal Indian citizen, I love my country but I pray to Allah subhanahu wa taala. I don’t pray to Saudi Arabia, despite it having Islam’s two holiest places. I pray only to Allah subhanahu wa taala. But at the same time I am a loyal Indian. So what is wrong in that? And also let me clarify that I am against Hindutva and I will continue to oppose it till God permits me to live in this world. I am not against Hinduism. Savarkar himself says that Hindutva and Hinduism are separate. I am not against Hindus at all. I am against the Hindutva philosophy of the Sangh Parivar which wants to convert this country – which celebrates all religions, which allows plurality and diversity, which is the ethos of India – into a theological or Hindu rashtra. People have questioned the timing of your statement, “I will not say Bharat Mata even if someone puts a knife to my throat”. RSS head Mohan Bhagwat wasn’t even referring to Muslims when he said everyone should be taught to say “Bharat Mata”. He was referring to JNU. So why did you respond? Firstly, should I respond as a Member of Parliament and as a chief of a political party only when RSS talks about Muslims? Don’t I have a right to talk about saving my country’s secularism, saving the ethos of this country? Why are you bracketing me, as one journalist Jyoti Punwani has done on Scroll.in, as a “Muslim”. Can’t I respond as an Indian? Simply by talking about it, the article says, I have made it a Muslim issue. How is that so? Isn’t JNU part of our country? The whole world knows that there were doctored videos at play, injustice has happened. Yes, we disagree with the anti-India slogans and whoever has raised them, the law must take its course. But why are you bracketing me here? For God’s sake, if India becomes a Hindu rashtra is it not going to affect me as an Indian? After your statement, your party’s MLA, Waris Pathan got suspended from the Maharashtra Assembly on Wednesday also because he refused to say “Bharat Mata ki Jai”. Even secular parties such as the Congress and the Nationalist Congress Party supported his suspension. What is your reaction? Should Pathan have refused to say “Bharat Mata ki Jai”? Let me at the outset place my utmost respect for the speaker of an Assembly or Parliament. My query is this: When I entered the Andhra Pradesh Assembly in 1994, I was given a book which had the Dos and Don’ts for an MLA. The first thing that was written in it was that, “a member of a state Assembly should not raise slogans”. Because that is against the decorum of the house. This, therefore, must be the first instance in India’s parliamentary democracy when a member has been penalised for not raising a slogan. And, secondly, that slogan doesn’t find mention in the Maharashtra Assembly rules. Does it say that if a member does not say “Bharat Mata ki Jai” he will be suspended? There has been no violation of any law. Thirdly, the Congress’ and NCP’s action has shown the shallowness and duplicity of these parties who follow pseudo-secularism. The Congress made such a big deal of opposing the BJP-RSS on Rohith Vemula and JNU. They say they oppose the Savarkarite ideology. Now with the Congress MLAs supporting this Maharashtra Assembly resolution, aren’t you also following Savarkar’s ideology? I have been saying from day one, that both the Congress and the BJP are trying to destroy India’s secularism. If you play along with them then the Congress’ doesn’t brand you as communal and the BJP doesn’t brand you as anti-national. But the moment you turn against them, you get branded. So the Congress’ tall claims about tolerance have been shown to be completely hollow by supporting this in the Maharashtra Assembly and moving a censure motion against me in the Madhya Pradesh Assembly. Who benefits from this politics, though? Your point is taken that you’re not making this as a Muslim but by saying these things, aren’t you polarising the electorate and won’t that help communal parties? Many people have asked me this question. Let me ask you, am I the cause of Mr Modi coming to power with 282 seats? Am I responsible for the Aam Aadmi Party's victory in Delhi and the Congress losing Haryana. Or the People's Democratic Party and the BJP forming the government in Jammu and Kashmir? The Congress losing in Jharkhand or being wiped out in local elections in Hyderabad? Despite creating Telangana, the Congress lost in the state. And got wiped out even in the new Andhra state. So how am I responsible for polarisation? I am raising a simple point. The Indian Constitution gives me some fundamental rights – all I’m saying is, don’t take them away. Why should my strong objection or dissent be an issue? I am relying on my fundamental rights. Even Parliament can’t change the basic structure of the Constitution. So how am I wrong here? How am I polarising, when all I’m doing is demanding my rights? Do I aspire to become a leader of Muslims? No. I don’t want to ever become a leader of Muslims. Do I have the ambition of becoming a minister? No. Take it from me, I’ll never be a minister. Yes, I want to raise some core issues, I want socio-economic development of Muslims and Dalits. I want equality. I want justice. I want my constitutional rights. So what is wrong in that? The moment I violate the law, you take action against me. In the past, your party has also raised communal statements. Akbaruddin Owaisi is under prosecution for hate speech. Your party has committed violence when Taslima Nasreen was expected to visit Hyderabad. So aren’t Bhagwat and Owaisi two sides of the same coin? On what grounds can you then attack Mohan Bhagwat? Please understand that Asaduddin Owaisi celebrates India’s diversity, pluralism and secularism. Asaduddin Owaisi does not want India to become a theocratic or even a religious state. Asaduddin Owaisi believes in the Indian constitution. Bhagwat, at the end of the day, wants a Hindu rashtra. This can be amply proven from their own books written by their erstwhile ideologues. This is the core difference between Asaduddin Owaisi and the RSS. Asaduddin Owaisi didn’t go and demolish any religious structure. Asaduddin Owaisi didn’t go and ensure that people are butchered or burned. We are saying that the rule of law should be implemented. We want our constitutional rights, that’s all. As to the two incidents you have mentioned, prosecution is going on. Let the law take its own course. But am I saying that my feelings are bigger than the constitution? No, I am not saying that.